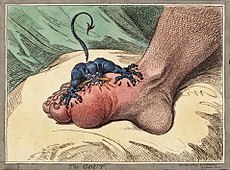 ↑ "Gout: an evidence-based review". J Clin Rheumatol. 14 (5 Suppl): S55–62. October 2008. PMID 18830092. doi:10.1097/RHU.0b013e3181896921. ↑ Schlesinger N (March 2010). "Diagnosing and treating gout: a review to aid primary care physicians". Postgrad Med. 122 (2): 157–61. PMID 20203467. doi:10.3810/pgm.2010.03.2133.